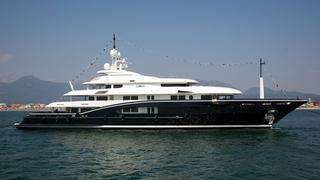 On June 30th I reported that Burgess had signed the new 70m motor yacht Numptia for charter and now Alev Karagulle tells me this superyacht is also for sale. Built by Rossi Navi, Italy with exterior styling by Design Studio Spadolini and naval architecture by Axis Group, Numptia is scheduled for delivery within a few weeks and is destined to be the talk of the Mediterranean this summer. Vast interior spaces and intelligent design offer the height of luxurious living in a modern, light and understated elegance. Her stylish Italian interior by Salvagni Architetti is contemporary and calm and creates an overall feeling of pure, stylish simplicity. Numptia offers a spectacular variety of large exterior deck areas, which offer guests the perfect platform for relaxing in peace and quiet or entertaining on a grand scale. The owner’s meticulous attention to detail is reflected in a truly fantastic, dedicated spa deck, complete with beauty salon, massage room, sauna, Turkish bath and a fully equipped gymnasium. Numptia accommodates 12 guests in six spacious guest cabins (full beam master suite, VIP suite, three queen-size double guest cabins and one twin guest cabin). All decks can be accessed via an expansive circular staircase and a glass elevator which links four decks runs through the heart of the yacht. Designed with charter and private cruising in mind, all guest areas enjoy state-of-the-art audio visual facilities including full Kaleidescape on-demand entertainment systems. Fully prepared for a summer of cruising, this brand new yacht has touch and go helicopter capability and carries a comprehensive inventory of watersports equipment.